Marigold Kitchen's Co-owners/chefs Tim Lanza and Andrew Kochan. The pair announced that the celebrated West Philadelphia BYOB would be closing for good this week. 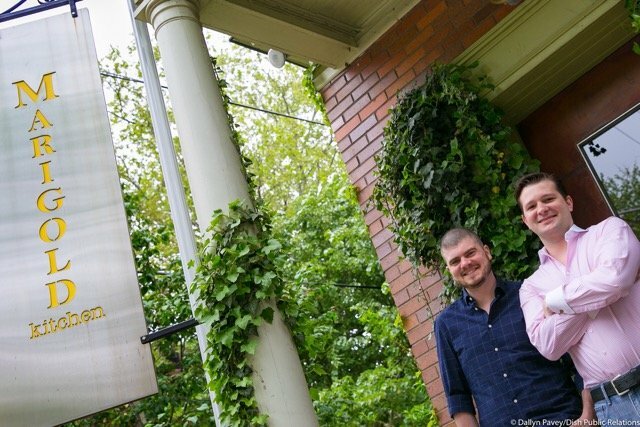 Just two months after restauranteurs Tim Lanza and Andrew Kochan shuttered their short-lived Rittenhouse restaurant, TALK, the pair have announced the end of their celebrated Spruce Hill mainstay, Marigold Kitchen. Kochan told Philadelphia Magazine that TALK's quick closure (it was open only five months) negatively impacted Marigold Kitchen's financial sustainability. Sadly, we will be closing the restaurant at the end of January but we look forward to seeing where these talented chefs land. Make your reservations now to celebrate our final four days of service on our website or call us at 2152223699! The BYOB first opened by Robert Halpern in 2009, and the restaurant has since solely offered 11-course tasting menus that rotate season to season, made with locally sourced ingredients. The restaurant was sold to Kochan and Lanza in 2014, who continued to run the kitchen and restaurant until bringing in Eric Leveillee as executive chef in 2018. Marigold Kitchen will serve its final dinners on Thursday, Jan. 31, but will continue to accept reservations now through the end.